This collection of essays demonstrates across a spectrum of cultural topics the productive intersection of feminism and German Studies. 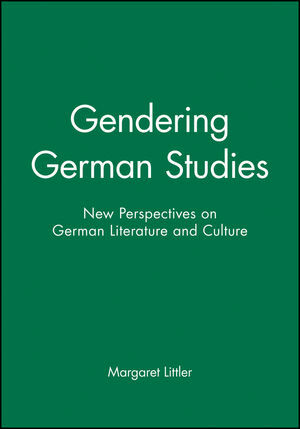 Taking gender as a central analytical catagory, the authors explore German literature from the Middle Ages to the present day, aspects of popular culture and film, and the impact of institutional and linguistic structures on womens's lives. Both in the variety of subjects treated and methodologies deployed, they reflect the increasingly interdisciplinary face of British German Studies today. Margaret Littler is a lecturer at the Univeristy of Manchester. 1. Foreword: Margaret Littler (University of Manchester). 2. What Difference does Feminism make to the Study of German Literature? : Helen Watanabe O'Kelly (Exeter College, Oxford). 3. God and Gynacology: Women's Secrets in the Dutch Historiebijbel Van 1360: Maria Sherwood-Smith. 4. Narren, Schelme und Frauen: Zum Verhultnis von Narrentum und Weiblichkeit in der literatur des Sputmittelalters und der Fruhen Neuzeit: Ulrike Zitzlsperger (University of Exeter). 5. Starving for Identity: Wasting Women in German Literature 1775-1820: Anna Richards (Balliol College, Oxford). 6. Schlechtes Mensch/Gutes Opfer: The Role of Marie in Georg Buchners Woyzeck: Laura Martin (University of Glasgow). 7. The Power in the Test: Reading Women Writing Drama: Sarah Colvin (St Johns College, Oxford). 8. Am schlimmsten ists, wenn auch noch Frauen die Romane schreiben: Sexual Politics in the Literary Works of Lily Braun: Caroline Bland (University of Sheffield). 9. Mothers and Lovers in some Novels by Kafka and Brod: Ritchie Robertson (St Johns College, Oxford). 10. In Blaubarts Schatten: Murder, Murchen and Memory: Mererid Puw Davies (Magdalen College, Oxford). 11. The Politics of Innerlichkeit: Karin Strucks Klassenliebe and Verena Stefans Huutungen: Joanne Leal (Birkbeck College, London). 12. Reflections of the Heimat Genre: Intertextual Reference in Reitzs Heimat: Rachel Palfreyman (University of Nottingham). 13. Women in the Texts and Contexts of South West German Naturtheatre: Alison Phipps (University of Glasgow). 14. Window of Opportunity or Flash in the Pan? Women Notaries in the New Federal States of Germany: Gisela Shaw (University of the West of England). 15. Der Lehrer Schimpfte Mit Ihren Schulern: Perspectives on the Changing Use of the in-suffix: Victoria Martin (St Annes College, Oxford). * Offers a cross-section of new research in one of the most rapidly-growing areas of British German Studies. * Highlights the importance of gender as a key analytical category in the study of German literature and culture.